CM Special: 101 Amazing Apps – On sale now! If you fancy using your iPhone, iPad, Android device or Windows Mobile phone to explore new territories in composition, bring more freedom to your live shows or simply streamline your kit bag, you need our new cm Special, 101 amazing apps. From gig-friendly tuners, metronomes, chord books and guitar FX pedals to synths, sequencers, grooveboxes and beat-creation tools guaranteed to get producers re-inspired, we've got it all covered. There are tutorials on the more complex apps, plus techno legend Richie Hawtin reveals why he's already adopted theiPad into his setup for the eargasmic Plastikman tour. And if you don't have a smartphone or iPad, we've got your back: we reveal how to optimise your netbook for mobile music-making too. 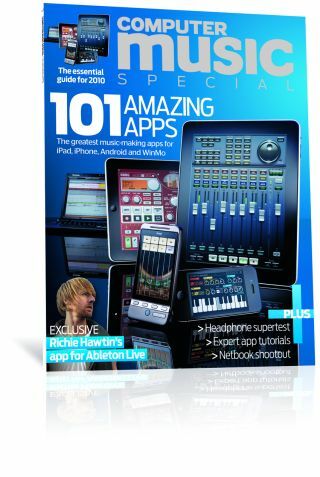 cm Special 43: 101 amazing apps is on sale now in the UK. Overseas dates are roughly: USA + 4 weeks after UK / Australia +8 weeks / Europe +2 weeks / South Africa +6 weeks / Canada +4 weeks. Alternatively, order online at www.myfavouritemagazines.co.uk. You can now subscribe to cm Specials here!